Vlog 129: 9 things on the list..
I’ve got back into playing pool. So much fun and it brings back a lot of great memories…maybe I should attempt a pool cue build…. Why not just put a tool well in the middle of the bench as part of the initial design? one side of the bench has now become inaccessible not sure this adds any benefit to the bench. How does that side become inaccessible? The tool well is 8″ wide. By your statement, wouldn’t that make anything further than 8″ from the leg vise side of the workbench not usable as well? I have been a fan of the twin Jay videos like this in the past, but this is one of the videos that I really wish you went into detail on how you decided certain things. Do you plan on having a follow up video on the tool well and how it is working out?….. Everything is in the article. What tool did you use to cut the joinery on the tool well? It’s in the article. You’re a neat freak. You aren’t going to like how messy the tool well gets. I disagree. Just pickup as normal. Next build is the coffee table. What style of videos would you prefer for it? Thnks for your work on various forms of communication Jay I watch them all and your enthusiasm and skills are additive. You do inspire me as well to try things I would normally not think about doing. Keep up the good work and making sawdust. Thank you very much for the feedback and kind words, Tom. They still allow smoking there? I have no idea how i ever stood being in a bar where it was allowed now that it’s been banned for a good 10+ years in New York. I will not go anywhere it is allowed any more, it’s just not worth it. I’m not sure how it works. The city has banned smoking in public locations but I think they are grandfathered in for some reason? Thanks for the feedback! The answer to the Cheez-its question is never good news. The lights have a 92-95 CRI. I like the tool well. Especially how it will hold a saw. I put a 7″ wide tool well in late last year also, and really like it too, especially for the ‘short-term-storage’ it offers. Just a thought on ‘reaching’ over it, in order to make use of that side of the table. 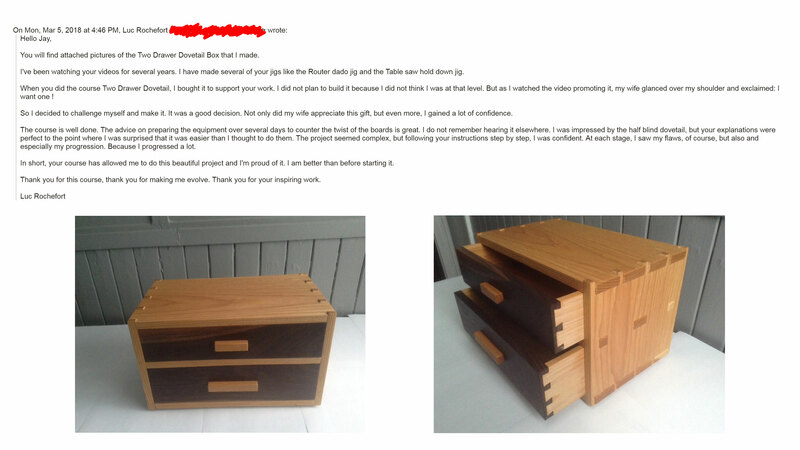 I seriously contemplated recessing it lower than the level of the table height by 1/4″ to 1/2″ and adding a (piano) hinged same-thickness wooden cover over it, in order to reduce dust/debris from falling into it as well as making that edge of the table ‘reachable’. Didn’t end up doing it, but time will tell if I might. For now, I enjoy it as is, as do you. One thing I did, though , was leave a 1/16″ open edge along the bottom. so that dust/wood chips can fall out freely on their own, but not screws or tools(hopefully). Enjoy all your videos very much. Thanks for the inspiration and effort to communicate so technically and thoroughly! Thanks Jay, you have been fantastic. I found out about you 3 or 4-years ago by Googling the miter saw I had purchased. This led me to your videos. 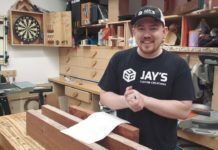 I’ve followed your videos ever since and have built a bunch of your projects (miter station, router guide, modified Pualk, lumber rack…). You have introduced me to a bunch of other wood workers (April Wilkerson, Nick Ferry, Jimmy Diresta, Shawn Stone) that I might not have otherwise found. I can’t thank-you enough for all the content you put out. I think you do it in the best manner possible, making it clear and not too daunting. Thanks for helping me tackle projects I might not have considered in the past. Can you direct me to a video where you explained why you got rid of the old assembly table? Or did you just want a change? 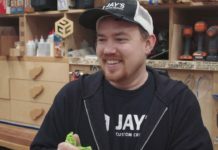 Jay, I’ve recently started watching your videos. To say the least, I’m really digging your material. I rather enjoy your mentality and simplistic approach to what would seem like a tedious task. Thanks for breaking things down and talking about technique and the process. The upcoming coffee table looks very cool. I would like to see a video(s) with some detailed explanation on how you go about building it. Keep up the great work!